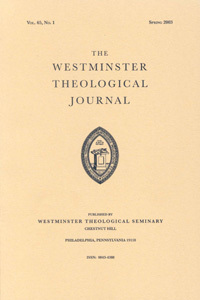 The Westminster Theological Journal (WTJ), published semi-annually, is one of America’s premier conservative theological journals, specializing in all aspects of theology, church history, and biblical interpretation. The journal’s inaugural issue appeared in 1938, making it one of America’s oldest continuous running theological journals. The journal exists to further Reformed theological scholarship and through it to serve the ministers and members of Presbyterian and Reformed churches. Each issue includes a number of scholarly articles and book reviews by seminary faculty, scholars active in their fields, and graduate students. The journal was “founded upon the conviction that the Holy Scriptures are the word of God and the only infallible rule of faith and practice, and that the system of belief commonly designated the Reformed Faith is the purest and most consistent formulation and expression of the system of truth set forth in the Holy Scriptures” (WTJ, 1938, vol. 1, p.1). The journal's editors are appointed by the faculty of Westminster Theological Seminary, and it has the purpose of publishing scholarly work that defends and advances understanding of the Bible's teaching and its implications for the larger world. The journal adheres to standard practices in publication ethics and publication malpractice. The decision to publish an article will be based on the paper's importance, originality and clarity, validity and relevance to the journal's scope. The journal does not tolerate copyright infringement, libel, or plagiarism in any form. The journal is currently edited for the faculty of Westminster Theological Seminary by K. Scott Oliphint, Editor; Stephen Coleman, Co-Editor; Brandon D. Crowe, Book Review Editor; and Randall J. Pederson, Managing Editor. If you would like to subscribe to the journal, please click on the link "Subscriptions and Customer Service" at the left of this page. Annual subscription rates are $50.00 for institutions, $30.00 for individuals, and $25.00 for students. The Fall issue has now shipped to subscribers. We hope you enjoy yet another issue of Reformed scholarship. Richard A. Muller, "Calvin on Divine Attributes: A Question of Terminology and Method"